Note from the editors: Many students in the Journalism program researched and shared their perspectives on technology and social media. They wrote about the impact these two topics have on society, including quotes from their Journalism classmates. The articles are insightful and interesting, showing various perspectives. Here are some excerpts. Mobile technology is disrupting the natural process of growing up for teens because of the increase of narcissism. for themselves and there is craving of admiration from others. An example on social media is when a person posts too many selfies in their Instagram page. Teens now a days have not moved away from that narcissistic stage or it takes them longer to move on. Mobile technology is creating those barriers which are preventing teens from moving on from that narcissistic stage. A new study has shown that when teenagers use social media is to feed their egos. In a 2013 Huffington Post article, “What Social Media Reveals About Narcissism,” it was shown that “Twitter fuels younger adults’ narcissistic tendencies by acting as a megaphone for their thoughts.” Some people might even be creating an alter ego online because of their traits in person. 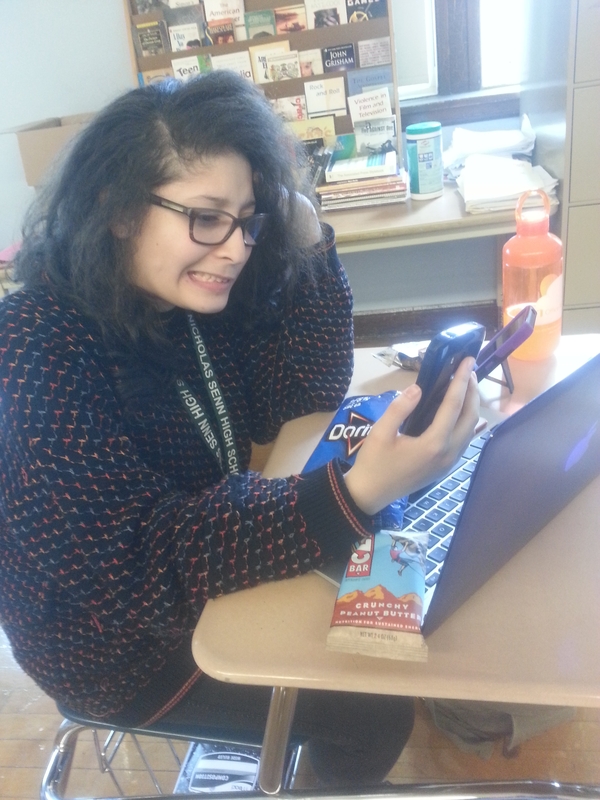 At Senn High School, some people agree that teenagers have become too narcissistic. Senn High School teacher Michael Cullinane said, “Too many teenagers are spending too much time in their minds thinking about how people are perceiving them.” Teens have been too fed up on creating a new image online and seeking attention from that new image that they forget all about reality. By spending too much time online, teenagers are losing focus and connection to aspects of their lives such as time spent with family. Many teens are spending an average of 3 to 4 hours texting daily even at home and parents get irritated it. Teens are so engaged on social media that they forget about the people around them. The majority of Senn High School students believe that they can’t survive without social medias such as Facebook, Snapchat, Twitter, and Instagram. An enormous number of teenage spend too much time online because they don’t want to miss out in what is happening in their friends’ lives. Senior Kiara Sanchez is on her smartphone every time she gets a chance even when she is at the dinner table with her parent. “Instead of having dinner conversations with my family, I am busy texting on my phone,” said Sanchez who realizes she is doing something wrong but can’t stop. Social media and texting are becoming substitutes for face to face conversations; they are affecting teens’ abilities to talk and interact outside of their smartphones. During lunch time, free periods and after school, teens are on their phones. They use free time to go on social media or text instead of talking to the people around them. They no longer have to face small talk or eye contact, or even have a conversation at all. Students can just look at the screen in front of them and pretend they’re in another world; this is reducing interaction between teens. Psychologist, Melissa Ortega, agrees in her article, “When Children Text All Day, What Happens to Their Social Skills?” She says that teens don’t know how to handle conflict face to face because so many things happen through some sort of technology. As Ortega says, conversation takes practice, and that practice becomes much harder if people have an entertaining device in front of them when they don’t know what to say. So, how can we change this pattern? Next time you’re at lunch with your friends, put all your phones away and have a conversation. Obsession is also a side effect of social media. Social media provides a platform for people to share their personal lives with others and feel good about themselves when they get “likes”. It is a “bragging” platform where you want others to wish that their lives were as interesting as yours. However, this obsession may also lead to depression. Teenagers may get depressed about their life, and might feel bad about themselves or their lives and hence try to ‘fit in’ by doing the same activities as their peers without realizing if it is wrong or right. The main idea that teenagers need to keep in mind is that they should try not to get influenced easily by such pictures or posts and always think about whether it’s right or wrong before taking any action.